Peter Falk as Columbo in A Friend in Deed (1974) crosses Rodeo Drive with the Beverly Wilshire Hotel at back, compared with Charlie Chaplin in City Lights (1931). This episode is nearly closer in time to Chaplin’s era than to our own. I’ve been enjoying watching Peter Falk as Columbo on Netflix, and am transfixed by the time travel elements of this now decades-old series. The population of Los Angeles has nearly doubled since the time of filming, and there’s something quaint, and poignant, about seeing a handful of cars easily traverse the nearly empty stretches of the Pacific Coast Highway or Wilshire Boulevard presented in the show, that are today impossibly clogged with traffic. The Newport Beach Pavilion appearing with Buster Keaton in College (1927), and with Suzanne Pleshette in Dead Weight (1971). This episode is now closer in time to Buster’s era than to our own. Classic film stars like Myrna Loy and Vincent Price play lead roles in the Columbo series, as does Leslie Nielsen in his pre-‘Naked Gun’ days. The homes are stylishly decorated with shag carpets and orange wallpaper, and the men all wear sideburns and extra wide jacket lapels. Matching views north up Larchmont looking towards Beverly. At left, Harold Lloyd in For Heaven’s Sake (1926), the opening shot of Columbo episode A Stitch in Crime (1973), and Snub Pollard in The Big Shot (1928). 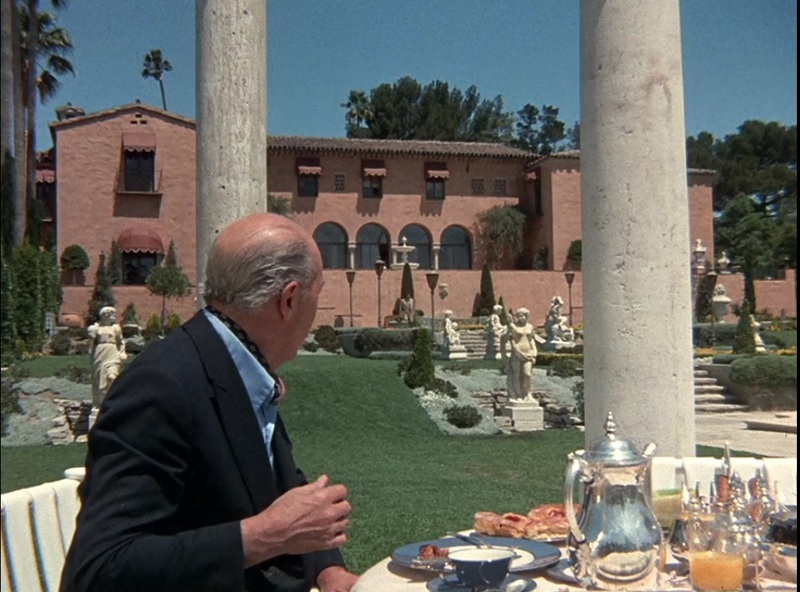 Since the Columbo murderers are nearly always entitled millionaires, a remarkable number of classic Los Angeles mansions appear in the show. The extant Beverly House owned by William Randolph Hearst (1011 N. Beverly Dr., Beverly Hills), that portrayed the ‘horse-head’ house in The Godfather, appears in ‘Death Lends a Hand’ (see left). A view of the lost Marion and Thomson estate ‘The Enchanted Hill’ in Identity Crisis (1975). Columbo drove through this arch (above) towards the front door. 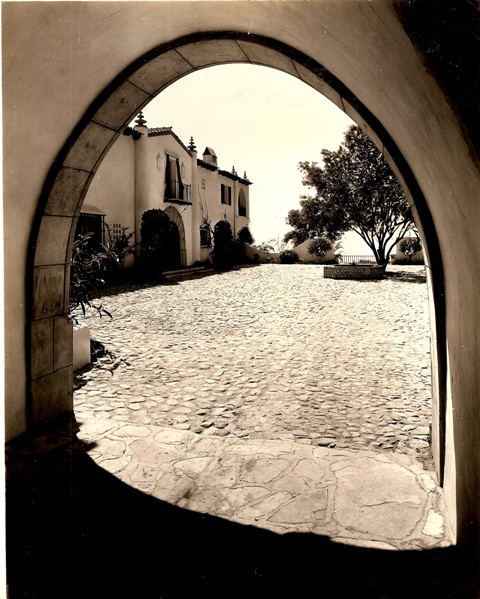 The former home of silent film screenwriter Frances Marion and her husband Fred Thomson, known as ‘The Enchanted Hill,’ appears prominently both inside and out in the episode ‘Identity Crisis,’ and also in ‘Fade to Murder.’ Tragically, Microsoft billionaire Paul Allen bought the estate and tore it down in 1997, where it remains an empty site to this day. You can read all about The Enchanted Hill at Steve Vaught’s wonderful Paradise Leased blog HERE. 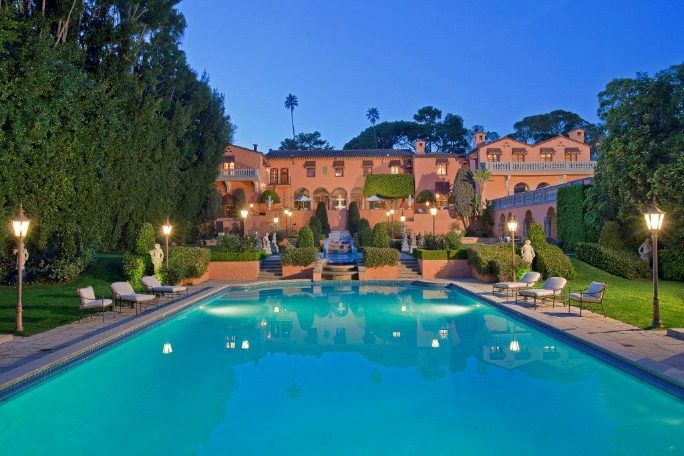 The episode ‘A Case of Immunity’ is a special treat for Harold Lloyd fans, as it was filmed extensively, inside and out, at Lloyd’s ‘Greenacres’ mansion (1740 Green Acres Place Beverly Hills),in 1975, a few years after Lloyd’s death. 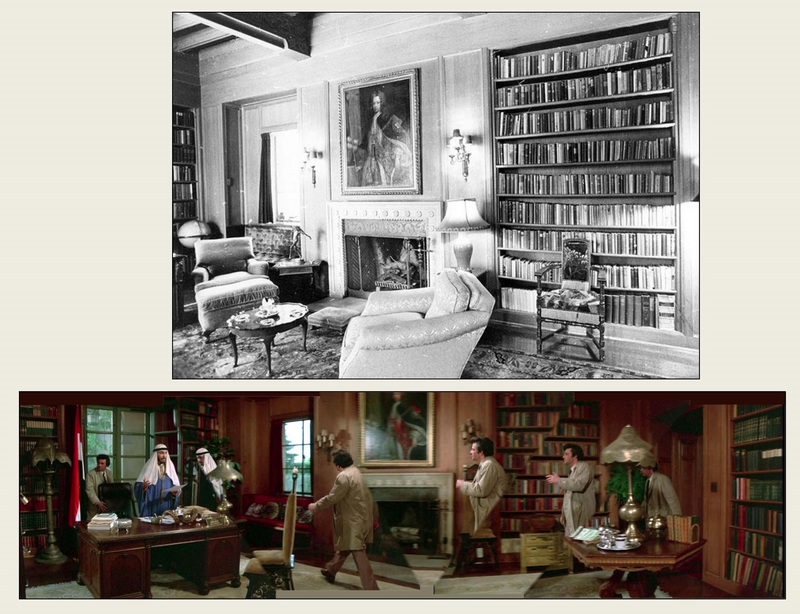 Here below are a number of frame grabs of the Lloyd estate from this episode. At the time the double room kitchen had the original stoves and giant refrigerators. Harold Lloyd’s Greenacres courtyard entrance – Library of Congress. Rear corner of estate – Library of Congress. 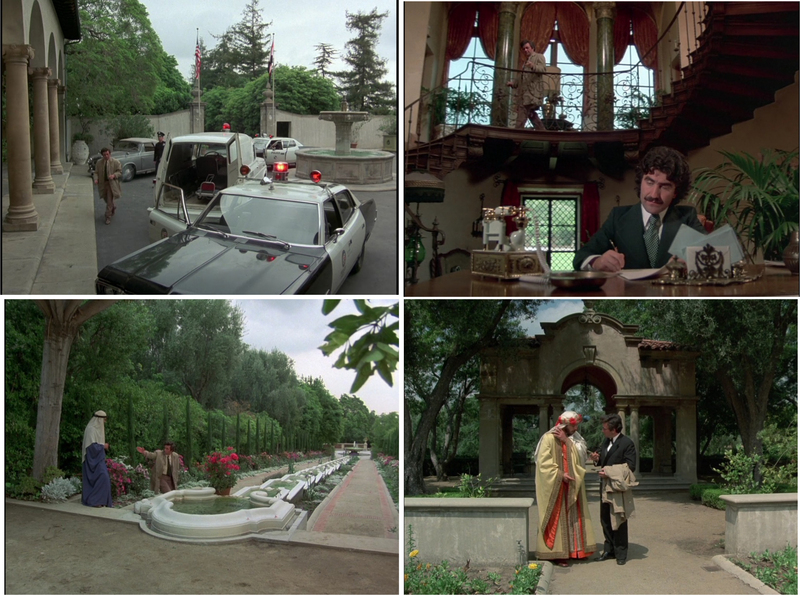 Click to enlarge – views of the entrance courtyard, the interior master staircase, the cascading fountain, now lost to subdivision, that also appears in the 1973 science fiction thriller Westworld, and a free-standing pergola. The Greenacres living room reached by descending a few steps. The two adjoining kitchen rooms showing the original refrigerator that can be accessed from either room. During ‘A Friend in Deed’ Columbo crosses Rodeo Drive to visit the Van Cleef and Arpels jewelry store (at top) – it stands today at the same location as in 1974. This entry was posted in TV Shows and tagged Buster Keaton, Charlie Chaplin, Columbo, Frances Marion, Fred Thomson, Greenacres, Harold Lloyd, Peter Falk, Silent Movie Locations, The Enchanted Hill, then and now. Bookmark the permalink. Excellent observations John. At some point (once I’ve exhausted all the silent era and 30s films) I’m going to turn my attention to shows like COLUMBO, CANNON and DRAGNET as each of these shows did extensive location filming. I think I have enjoyed this latest posting the most of all your recent work. I too, just happen to be watching the Columbo episodes on Netflix and I find I am enjoying them more for the locations than the actual story lines. Bittersweet moment for me is your context of time. The point that some of these episodes are closer in time to Keaton & Chaplin than to current time condenses the last 90 or so years very quickly. Thank you once more for shaking up a rather mundane daily existance here in sunny Souhern California! Thanks Greg – it is bittersweet seeing the way things were, and realizing how quickly time condenses the present into the past. I still can’t shake how sparse and uncluttered the outdoor settings appear back then, before the population doubled. It’s a shame William Powell had retired by the time Columbo rolled around. There’s no way Falk could have outwitted him. All right, so I’m being picky, but that’s not an ice box in the Lloyd kitchen. It’s a refrigerator. And thanks for identifying the Columbo episode filmed there so I can see it again.